The first time I heard about Michel’s is because of its flavored beers but never did I thought that this place is perfect for gatherings or simply for romantic dates. I rarely go to places that are far from my apartment but this one, I gave it a chance because this is the first time I will celebrate with my blogging family. Even though it was raining that night and it was rushed hour, I still managed to arrive on that place before the party started. It’s a great thing that they have an enormous name glowing along the street of AS Fortuna. I brought Clariel with me since I was allowed to bring a plus one during the party. She was my highschool classmate and one of my closest friends up to know. Even though we are on different fields, we still have time to go out and catch up with each other. I am glad that she enjoyed and got acquainted on some of my blogging family. The #UltimateHibstersParty is a combination of Christmas Party and Victory/Thanksgiving Party because three of the Cebu Blogging Community members won during this year’s Best Cebu Blog Awards. We have Rea Alducente of Blissful Snapshots as Best Photoblogger, Jullian Sibi of Utterly Random Techie as the Best Techblogger and Christoeffer John Restauro of Four-eyed Laagan as Best in Creative Writing. 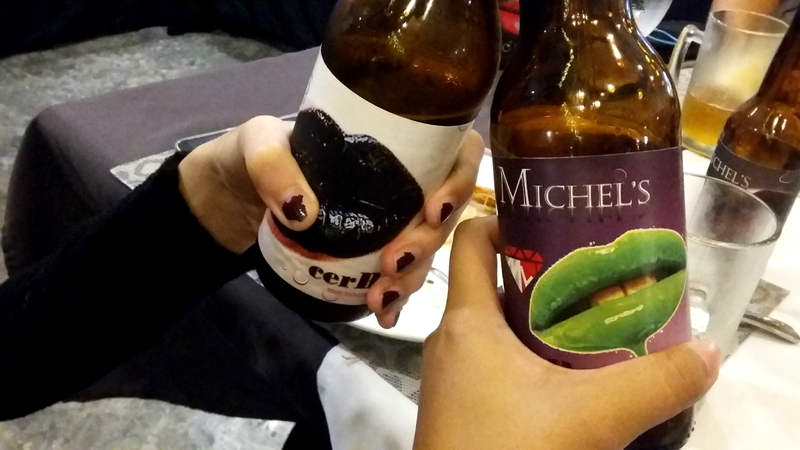 So you see, Michel’s Bistro is a perfect place to hold celebrations like this because their exquisite craft beers are worthy for a malty adventure. We were served with four flavors and to my apologies, I haven’t gotten all of their names. 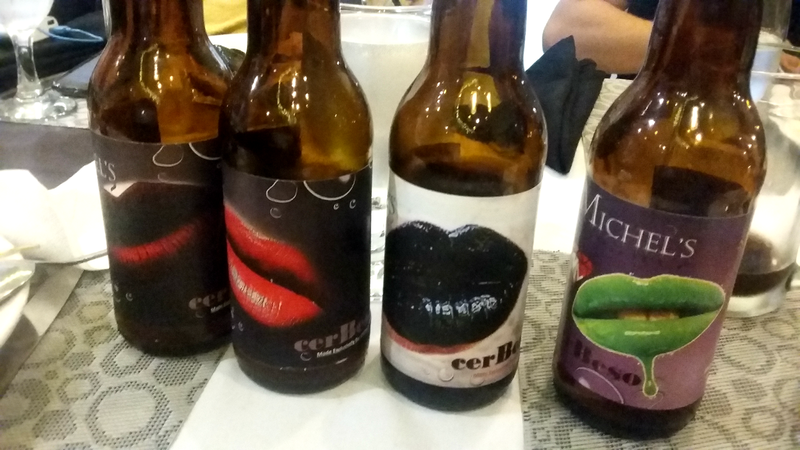 I was so much engaged with the beer I was drinking when the Executive Consultant of Michel’s Bistro, Mr. William Belda was introducing to us all the four craft beers. But allow me to share to you the top two of my favorites, first is the Dia which is a citrus brew with some spicy notes and hint of white coriander and the bottle with the green lips which I guess has the raw taste of an original flavored beer. The sophisticated interior with shelves of wines neatly arranged and the lighting gives a perfect ambiance for a romantic date. I would definitely bring my boyfriend here for our anniversary, monthsary or even weeksary. If there is such thing as weeksary. 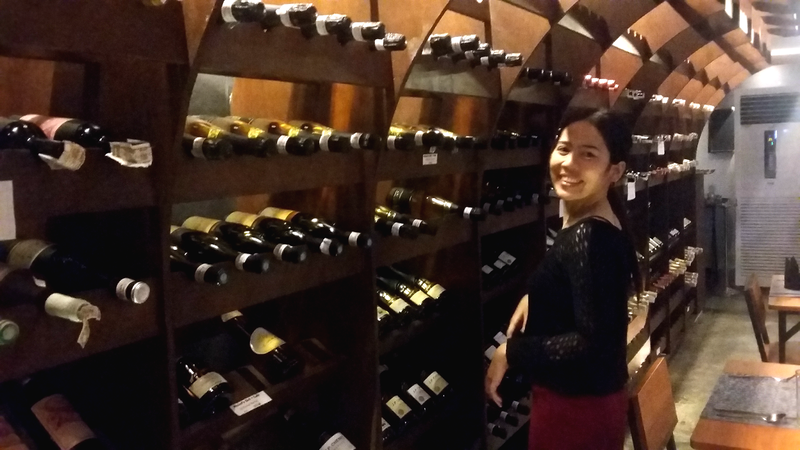 It piqued me of tasting some of their wines because they are on different flavors. So maybe when I come back here, I might have a bottle or two for me and my girls. They don’t only serve wines and beers but they also have palatable dishes that everyone should try. There’s a wide array of food you can find in the menu, from an all day gourmet to sausage menu, appetizer, soup, pasta, chicken, salad and so on. Prices may be a bit much for a stingy person’s budget but their gastronomic offerings are definitely worth it. I haven’t asked if which one was their bestseller but the Seafood Paella was my favorite. I am not a fan of seafood and flavored rice because I find it unappealing for my eyes and appetite. But because I have this rule for my stomach that if I go to parties, I should try all the food served on the table. Surprisingly, this seafood paella has defied my judgement on this kind of dish. I was so excited to share it with my Muslim friends since they are constantly looking for halal dishes to dine in. So here are the members of Cebu Blogging Community (except for Clariel because she is my plus one) and this group is also called as the Hibsters because we do High Intensity Blogging. I have only known them for almost a couple of months but I have already treated them as brothers and sisters. More likely they are a family to me. I gave been blogging since 2010 and only this year I have taken it outside my comfort zone. I have plenty of doubts and insecurities but I thank the Heaven for sending these angels to guide me when it comes to my passion. In a short span of time, I have learned a lot from them and I realized that we are all unique yet we all have amazing blogs. I would like to thank Michel’s Bistro for hosting the #UltimateHibstersParty with their delectable food and breverages. And to the Hibsters for this opportunity to be one of the members of CBC and HIB. Michel’s Bistro is located at El Dorado Subdivision, A.S. Fortuna St. Cebu City (infront the Coffee Factory) and is open from 9-AM to 11-PM everyday. You can also enjoy their 50% discount every afternoon from 2:00-5:00PM. I really enjoyed that night! It was great to see all of you and Cla-cla! Thank you for the special mention! It was really fun and I love their food! Especially the red velvet! Enjoyed this day including the after party.. wow.. daghanang nindot ug tingog oi.. especiall master lai.. I truly enjoy this place during my visit and I had a great time as well. The foods and the whole set up of the place is already enough reason to go back here. I enjoyed that night. Glad to know that other members enjoyed that party too.